Our Marketing Manager, Brian Holmes, shared his reflections on a recent trip to Kenya to see the work of our partner, the Anglican Church of Kenya, Mount Kenya West. The most common, first question I was asked on arriving in Kenya was, ‘Have you ever been to Africa before?’ It struck me as strange, as we often ask about first time visits in countries, rather than continents; I can’t imagine anybody asked a first time visitor to Australia whether they’ve ever been to Oceania before. There is obviously a strong sense of an African identity to complement their Kenyan identity. So what does the word ‘Africa’ conjure in our minds? Is it famine, disaster and unremitting poverty? Is it endless conflict and corruption? Maybe deserts or jungle? Or hosts of wild animals roaming across vast landscapes. Obviously, Kenya is not Africa; it is a small part of the whole with its own variety of landscapes, climates and issues. The first thing that I noticed as we drove northwards out of Nairobi was how relatively clean everywhere was, even in small, roadside communities with market stalls abutting the road. About a year ago, Kenya banned plastic bags, and its visible effects are very noticeable. Whilst visiting communities, the second thing that struck me was the changeable and varied landscapes. As we criss-crossed the Equator, we went from rolling hills covered in verdant vegetation, through grassy savannahs to reach semi-arid, sparse and scrubby bushland. When the tarmacked roads stopped, we bounced along dusty, rutted tracks, which would have been impassable with the merest of showers. At every community visit, we were welcomed warmly, and it was obvious that the project staff of the Anglican Church of Kenya, Mount Kenya West (ACK) had built deep relationships with these communities and their leaders over the years. The common themes that emerged from the meetings were the impact of drinking on economically fragile families; the effects of abuse and negligence of children on communities; and the dangers of poor access to health services for people. For many years, ACK has been working on a large maternal and child health program for remote and semi-pastoralist communities. Funded by the Australian Government, ACK have worked with remote communities in the northern parts of the Central Highlands region of Kenya, to provide access to clean and safe medical care, especially during child birth. As a result of this work, ACK have identified other key areas that affect the lives of communities; namely family and community breakdown through gender-based violence and the neglect and abuse of children. 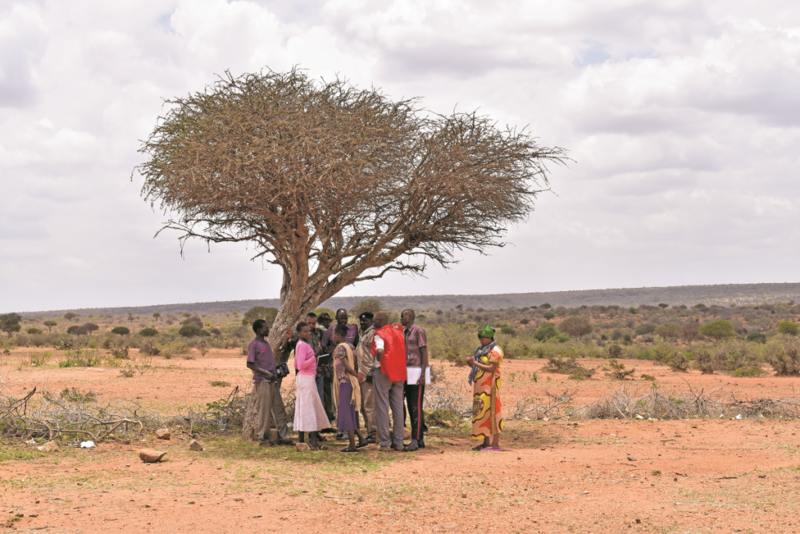 Kenya society is highly structured, right down to the household level, with communities been clustered into groups of ten households called ‘nyumba kumi’ (literally, ‘house ten’), which are responsible for fostering neighbourhood oversight. ACK has tapped into these groups by training what they call ‘paralegals’. These people then work within their communities to make them aware of the law, and the rights and responsibilities that operate. Within Kenyan culture there is a saying, “What belongs to home, belongs to home”, which basically means that whatever happens in the domestic setting is nobody else’s business. Obviously, in small communities everybody knows everybody’s business, but they don’t get involved, unless is escalates into a huge dispute. The work of the paralegals is challenging this notion and is holding people to account for their actions. Additionally, ACK is employing the same approach in a range of primary schools. By working with head teachers and the school board, two teachers are trained in child protection, guidance and counselling. These teachers then monitor the circumstances of the pupils and will engage when necessary, with the parents being involved when needed. They look for signs of neglect and abuse, such as hunger, poor clothing and hygiene, and in extreme cases, changed or withdrawn behaviour, which may indicate deeper issues at home. It is so easy to think of working to help alleviate poverty in terms of food and water, health and education, and difficult to understand how such ‘rights-based’ work helps. But such work breaks vicious circles. In a situation where there is too little money to buy food, if that money goes on alcohol, then the family goes hungry. Tempers flare and anger leads to violence. Such violence leads to injury and shame. Children may drop-out of school from same, or run away from home. Marriages break down, and families that were living on the edge of poverty are now mired in destitution. Meeting after meeting, I heard people recount how their lives were changed by the intervention of ACK’s community work. It’s not just about knowing the law and your rights, but understanding the impact of your actions on those around you, especially loved ones. In those cases, the combination of knowledge, compassion and dialogue have meant those families and individuals now have hope and can see a way forward to a better life. At the beginning of my visit, one of the first things I was able to share was the graduation of the latest cohort of about 30 paralegals. After an intensive 4 days of training, the Bishop of Mouth Kenya West, the Right Reverend Joseph Kagunda, concluded proceedings and presented them with their Certificates. With that, another 30 communities will now be given the chance to move forward in hope.